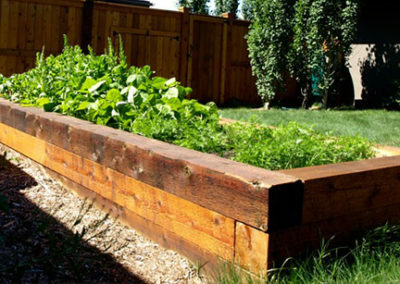 Eco-yards™ was founded on the belief that we should leave the land we steward in better shape than we found it. Life on earth depends on the vitality of the topsoil and the plants that grow in it. We can enrich the soil and enliven the energy of the places we steward by using sustainable landscaping methods. And we can create colourful, fragrant, life-enhancing, soul-enriching spaces. In this way we create a healthier, more beautiful, and fruitful world. My lifelong passion is beautifying landscapes in ways that enhance the natural environment. 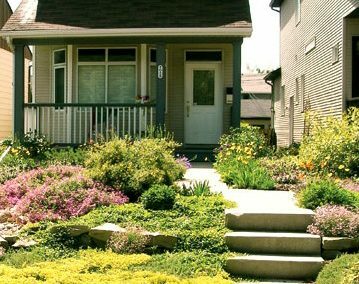 I have been landscaping most of my life, from helping my parent’s landscape yards as a child, in towns across Western Canada, to beautifying landscapes as an adult. Traveling and living in different landscapes around the world and North America has inspired my designs. I love flowers, especially designing landscapes with hardy, perennial flowers to provide colour and joy all growing season long. I also love delighting my clients with landscape designs that go beyond their desires and bring them more than they imagined. This involves listening, intuition and sharing ideas. I’ve taken courses, read lots of books and magazines, visited and spoken to gardeners whenever and wherever I can, and experimented with what works and what doesn’t in many different kinds of yards. I have worked as an international development educator, public involvement consultant, management consultant specializing in creativity, and as a shamanic healer and teacher. I work with a crew and sub-contractors who love the earth and beauty and pleasing clients too! Kaleigh Schmidt is a Landscape Designer, graduated from Fanshawe College in Ontario through the ‘Landscape Design’ degree program. 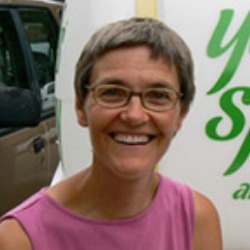 Passionate about bringing nature into the yards of many she continued her education, getting certified through The Living Centre in Permaculture Design, Forest Gardening, Food Foresting, as well as ‘Shamanu’ an earth wisdom mentorship. Kaleigh learned about the succession of an ecosystem as well as the significance of soil building practices for optimum garden health. She is dedicated to regenerative designing and has always been infatuated with nature and plants, with growing curiosity and wonderment. She is knowledgeable about the many roles of different plants and their importance within the larger ecosystems of our planet as well as the smaller eco-systems of our lives and bodies. She hopes to copy nature’s intelligence within her designing process. 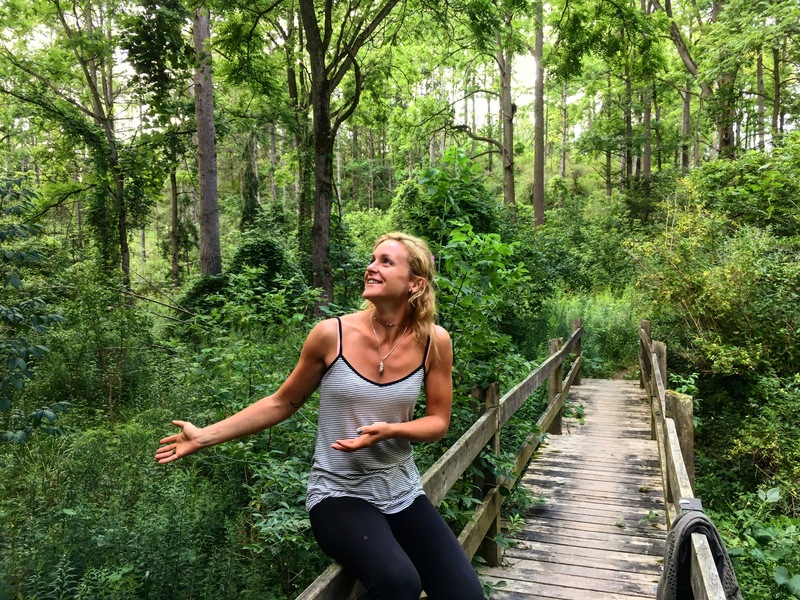 This has inspired her to create an ebook ‘Urban Nature’, as well as traveling to volunteer on permaculture farms located in Spain and California. Being immersed in the landscaping industry since 2013 she is happy to contribute her skills and knowledge as a team member of Eco-Yards. 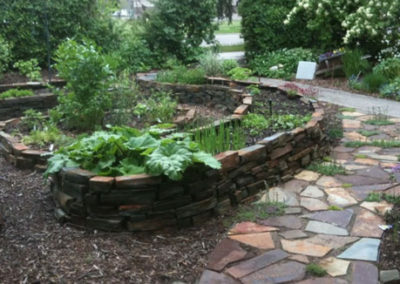 Lane Shordee comes to Eco-yards from a 12 year background building various types of landscaping projects; from hard landscape features such as ponds, decks, pathways and rock placement, to soft landscaping with a focus on native plant species. 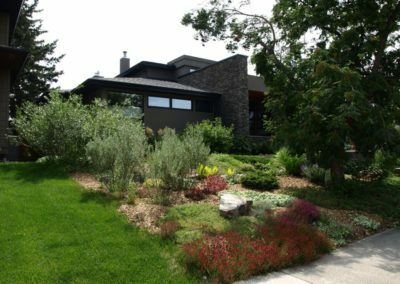 Lane has a fine arts degree from the Alberta College of Art and Design and brings a creative eye, looking at new ways to build and maintain landscapes. Lane also builds large scale ecological based artworks that range from theatre sets to permanent public artworks. Lauren is a new addition to the eco-yards team this year and is very excited to start her work and grow her passion. 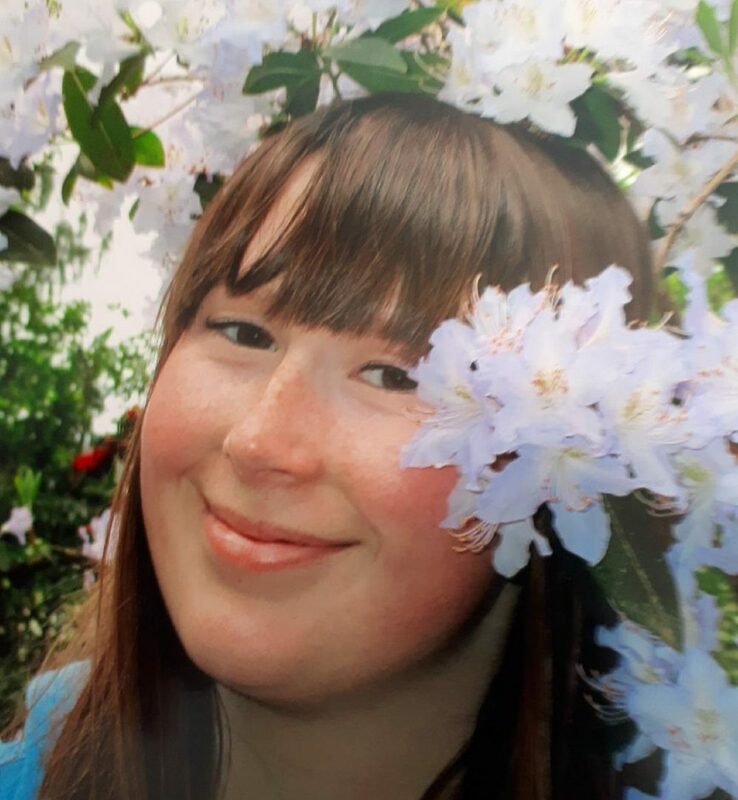 She has completed her second year at Olds college in the Agricultural Managment program with a focus on sustainable farming and is interested in going into horticulture or permaculture in the future. She has always loved all things green and looks forward to improving clients yards to to ecological living spaces using sustainable methods. She has worked as a private gardener, in a tomato greenhouse and on an organic farm. In her free time Lauren cares for her own garden, enjoys fishing, hiking and camping in the mountains as well as riding her horse. Riley Trodd has returned to Eco-Yards for his third year of landscaping. After escaping the stress of commercial construction he has enjoyed settling into the wholesome world of sustainable landscaping. His varied experience brings an alternative eye to problem solving which is a valuable asset for our creative solutions. 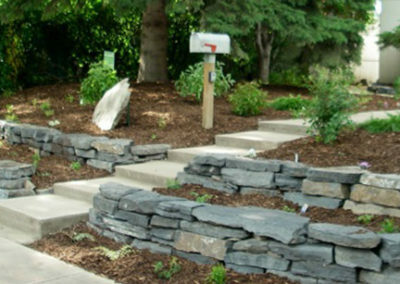 He has been instrumental in the the installation of: rain barrels, rock walls, stone paths, grading, and planting. Sam was born and raised in Calgary, Alberta. 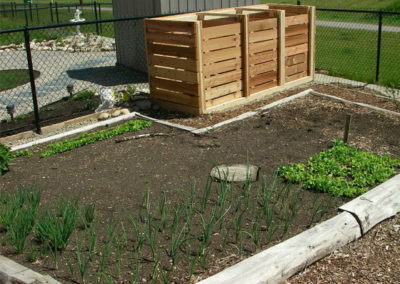 He is currently completing his Bachelor of Applied Science Degree in Horticulture at Olds College. 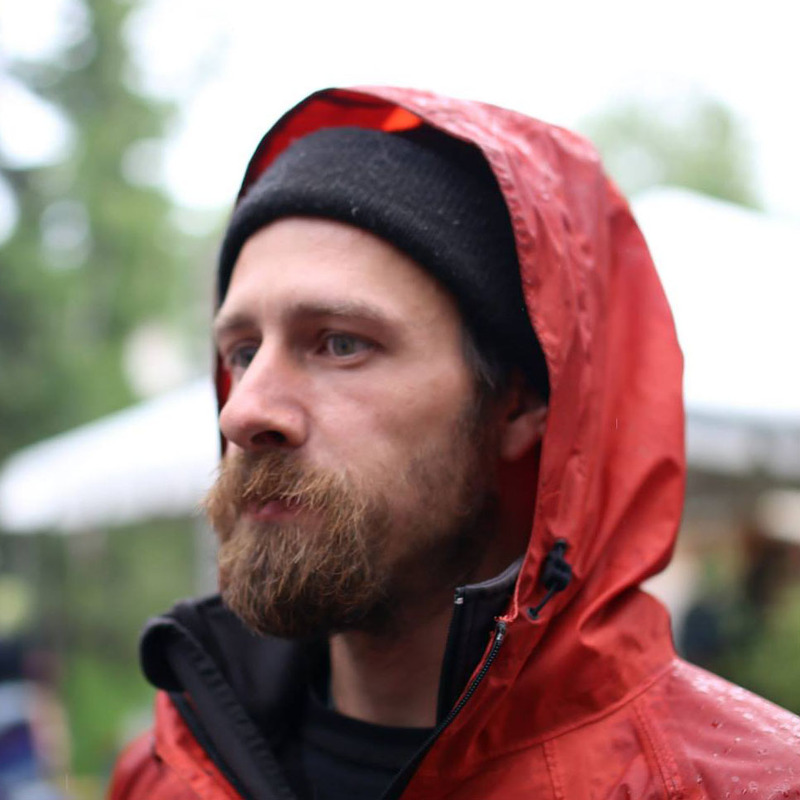 He has a background in the landscaping industry where he worked as a crew member at the Calgary Zoo for the last three seasons. 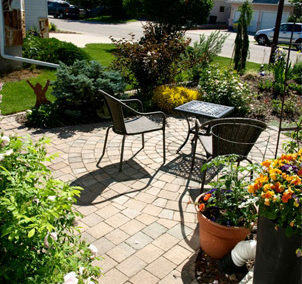 He is creative and has a special interest in landscape design. Sam is also interested in learning how to work with nature and the natural environment. He grew up with a mother and grandparents who were very passionate about gardening and he has always had a love for plants and the outdoors. He is very detail oriented and therefore always strives to provide high-quality results. His other interests include music, playing guitar, camping and skiing. 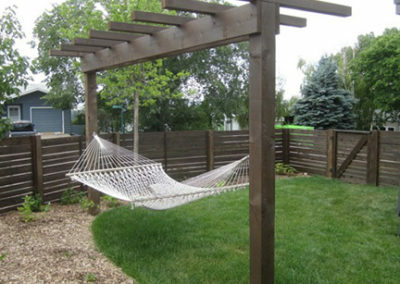 Here are a few yards and projects designed and installed by our Eco-yards™ crews. Our Process is beautiful and sustainable too! Every morning our crews circle up and set the intention to work harmoniously, lovingly, safely, efficiently, all while creating beauty. And they do! They work with joy and respect for each other and our clients. Our clients often say that as much as they love what we have done, they love the energy our crews bring to their home just as much. When we remove sod we take it for composting. Cover-over lawns with newspaper rather than hauling sod to the landfill. We usually use shovel, pick axe and wheelbarrow rather than bobcats. Use materials that are local and organic.